Vehicles drive past a storm drain along Bicentennial Boulevard near Whitewing Avenue on Monday, Dec. 18, 2017, in McAllen. McALLEN — Monthly utility bills will increase beginning in March in hopes of improving the city’s drainage, city commissioners voted unanimously on Monday. The drainage utility fee, which city officials anticipate to last eight years, will vary depending on the size of a property. McAllen’s engineering department estimates the average residence in McAllen is 2,700 square feet, which would amount to a $1.50 monthly fee on residents’ utility bill. 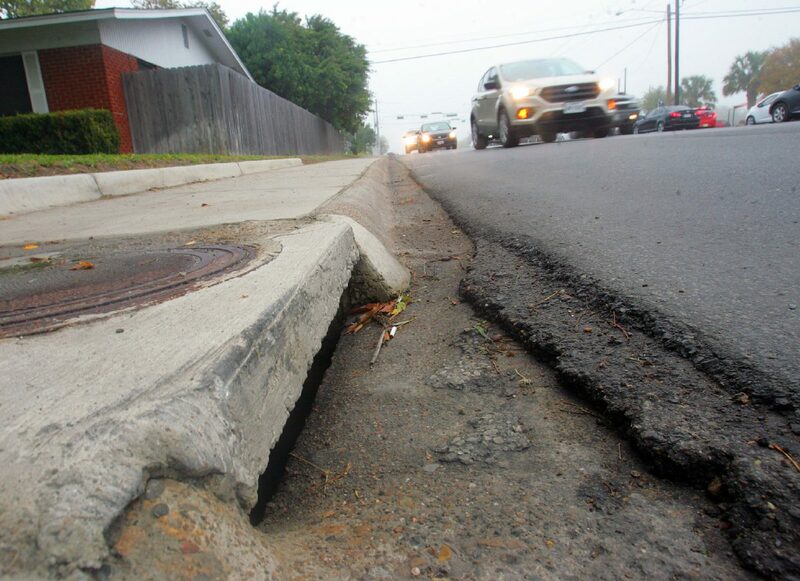 The average McAllen property’s drainage utility fee would be $18 per year. City officials determine the fee for each property by taking the total square footage of impervious cover at a property, divide it by 2,700 — the average square footage of a McAllen single-family residence — and multiple that number by 1.50. Pools and sheds are excluded from measuring impervious cover, City Engineer Yvette Barrera said, mostly because the appraisal district does not quantify pools and sheds when calculating impervious cover. Barrera used an example to explain how this will work: If a property has 3,074 square feet of impervious cover, you would divide that by 2,700 (the average square footage of a McAllen single family residence). That quotient comes to 1.14. This number is then multiplied by 1.50 (the price an average McAllen resident would pay). The final sum for that resident’s monthly drainage utility fee would come to $1.71. This fee, which will begin appearing on utility bills starting March 15, also applies to commercial properties. The only exemptions from the fee include institutions of higher education, state-owned property, property in its natural state, such as farm land, subdivided lots that do not have a certificate of occupancy and properties that have private drainage systems that do not discharge into a city facility, Barrera said. Commissioners decided they will review the fee annually. However, if the commission at any point votes to discontinue the fee, they cannot re-impose the fee for at least another five years. This fee is part of the city’s $46 million drainage master plan — $11.2 million of that would come from this fee and it would take eight years to reach that number, assuming there is a 100 percent collection rate. The rest of the money for the drainage master plan will likely come from capital improvements, a Tax Increment Reinvestment Zone (TIRZ), various grants and a drainage bond. Nothing is certain yet, but commissioners will likely vote at an upcoming commission meeting to hold a May bond election. One of the bonds would likely be for about $20 million in drainage projects. One member of the public voiced his displeasure at the process of implementing the fee, calling it a “political calculation.” The city also hosted two public hearings at two separate community centers in December for citizens to ask questions about the fee or express any concerns. Roughly 20 people, besides city staff, attended the two meetings altogether. District 2 Commissioner Joaquin “J.J.” Zamora said he was “disheartened” by the public participation in that process.